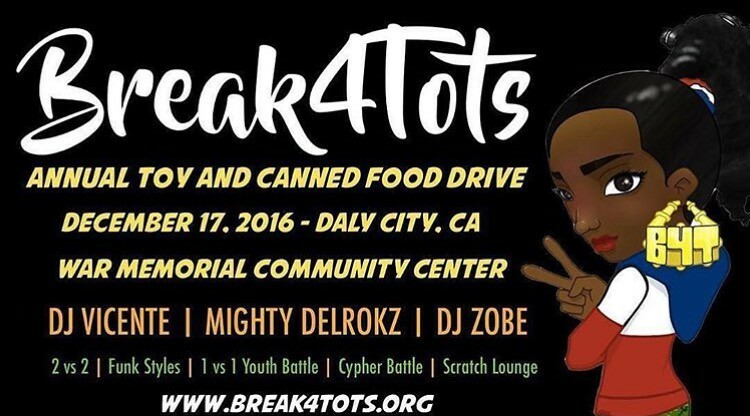 Join us on December 17th, 2016 to help Break 4 Tots serve the community one break at a time. Since 2005 Break 4 Tots has produced Hip-hop events as a means to bring our communities together, provide a space for the Hip-hop community to give back, and to provide services to youth programs locally and globally. This winter we are asking attendees to donate toys that will benefit Daly City’s Operation Santa and or non-perishable canned food that will support the Second Harvest Food bank. Proceeds beneift the Break 4 Tots Scholarship Fund. Break 4 Tots is awarding a scholarship to Hip-hop practitioners who are attending or will be attending college with the purpose of serving youth throuh Hip-hop arts. 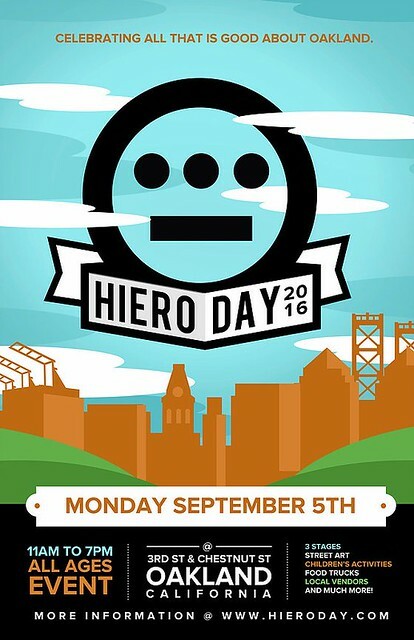 Proceeds will also benefit Youth and Teen programs for the Daly City Library & Recreation Services. Established in 1934, the Recreation Division of the Department of Library and Recreation Services serves Daly City, portions of San Francisco, Colma, Brisbane, South San Francisco and Pacifica. Today, the Division offers classes; sponsors adult, teen, and youth athletic and aquatic programs; and provides youth, teen, and active adult services. 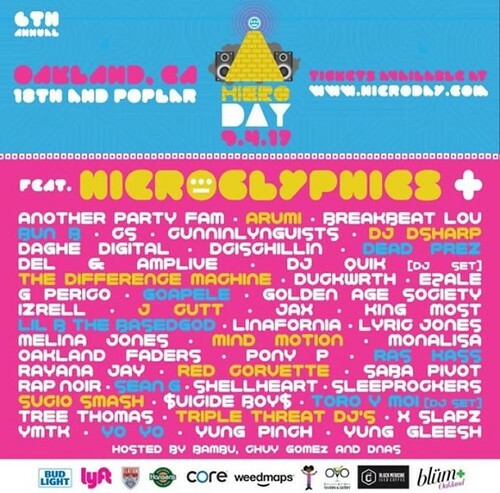 B-boys and girls will be getting down the breaks in one cypher while MC’s take turns rocking the mic. 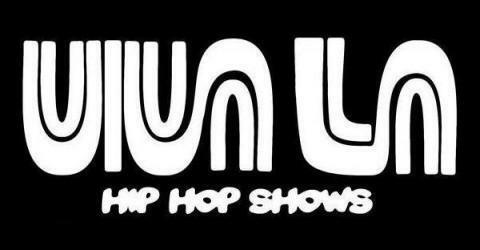 One MC and one B-boy or girl will be awarded as King or Queen of the Cypher. 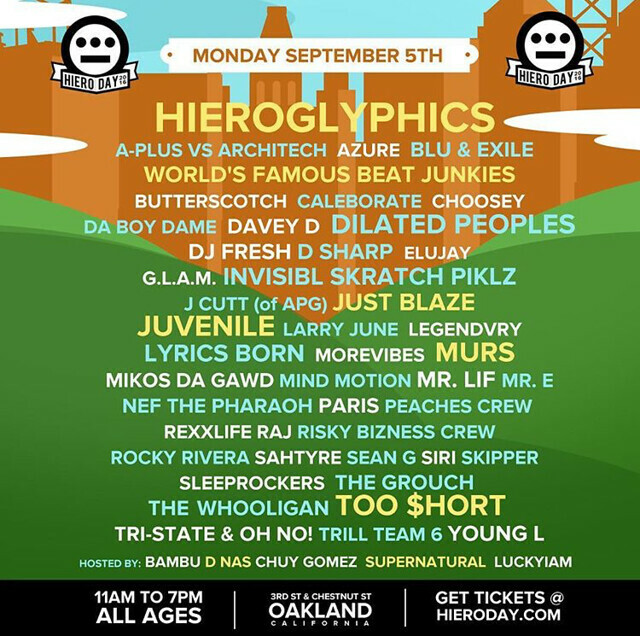 HIERO DAY is a one day event, combining an outdoor festival, concert, food, and block party where thousands come to celebrate all that is good about Oakland September 5, 2016. This community event brings together all ages and backgrounds. The event hosts a childrens area, multiple stages to host local and internationally renowned artists and DJs providing continuous entertainment from Hip-Hop, Jazz, Electronic, Alternative and R&B.